Samsung’s Galaxy Note Series is designed for pro-users who desire maximum productivity while being on the move and the very recently launched Note 9 is in line with this legacy. 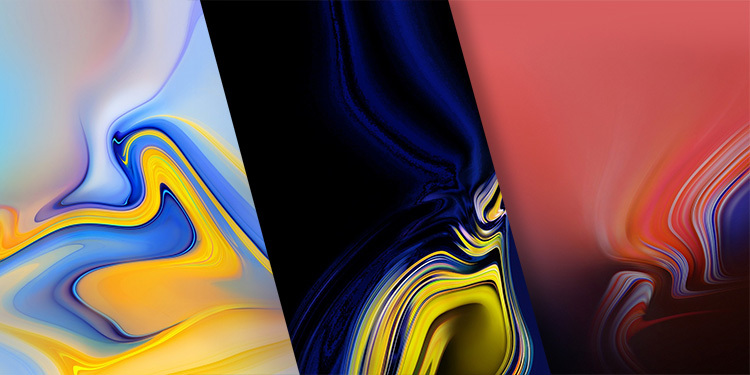 The company has already initiated pre-orders for the latest flagship and whether or not you’ve booked one for yourself, you can taste a spoonful of the luxury that Galaxy Note 9 offers by downloading the latest wallpapers. Thanks to the good folks at XDA, we can now download the latest Note 9 wallpapers. As usual, you do not require a separate app to grab these. All you have to do is download this ZIP file which has been packed by XDA to get the complete bunch of the stock wallpapers on the flagship phablet. One does not need a degree in art criticism to differentiate between the new and iconic wallpapers in Note 9 compared to the ones available on Note 8 or even Galaxy S9. One major difference is the use of punchy, contrasting colors and contouring which look like brush strokes and appear to be inspired by natural phenomena like weather of rocks. These also go hand-in-hand with the new shades of the Note 9 and the all-new S Pen. The Galaxy Note 9 is no doubt a great phone, but if you’re not convinced enough to spend around $1,000 and buy it already, you can have some peace by just downloading thee wallpapers for your current smartphone. If, however, you are looking to buy it, let me remind you of its goodness. The Note 9 features a gorgeous 6.4-inch Quad HD display, a Snapdragon 845 or Exynos 9810 (based on the region), has up to 8GB of RAM, and a massive 512GB flash storage which can be further expanded to 1TB using a microSD card. For photography, you get 12MP+12MP dual cameras on the back with the primary sensor supporting variable aperture while there’s an 8MP sensor for selfies. Quirks like wired and wireless fast charging, Samsung DeX, and the company’s own smart assistant – which recently got smarter – make the Galaxy Note 9 a power-packed device.